GeForce GTX 1080 and a 120Hz display for gaming on the go. Asus ROG announced a new, high-powered laptop that pairs up to an unlocked Intel Core i7-6820HK processor based on Skylake with an Nvidia GeForce GTX 1080 GPU. It's the G701VI and it's armed to the teeth with hardware and features that should keep it relevant for a long time to come. As with any high-end machine these days, Asus is billing its new Pascal-powered laptop as a VR-ready system. Maybe you're into VR and maybe you're not, but when you're not wearing a headset, Asus points out that you'll benefit from a super-fast 120Hz wide-viewing angle panel (17.3-inch, 1080p) with G-Sync technology baked in. According to Asus, it's the first laptop with a 120Hz G-Sync display. 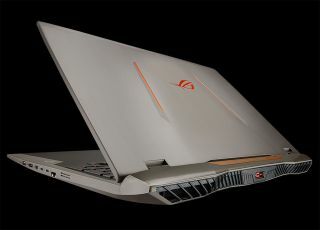 "To make proper use of the world’s first laptop to incorporate a 120Hz display panel with G-Sync, there is the overclockable NVIDIA GTX 1080. Desktop monitors have had it for a while now, it's about time laptops get the ultra-fast refresh rate treament!," Asus says. You're able to configure the G701VI with up to 64GB of DDR4-2400 RAM. Asus doesn't mention anything about storage, though on XoticPC (one of the few vendors currently selling this laptop) you have the option of stuffing up to two 1TB M.2 PCIe NVMe solid state drives, a rather expensive proposition on top of an already pricey laptop. The G701VI has three USB 3.0 ports, two USB 3.1 Type C ports (Gen 2! ), HDMI and mini DisplayPort outputs, 1.2MP HD webcam, 802.11ac Wi-Fi, Bluetooth 4.0, and Windows 10. All this comes wrapped in the familiar "Titanium Armor and Plasma Copper" chassis that Asus has been using lately. Asus didn't mention an MSRP, though both XoticPC and ExcaliberPC have it starting at $3,099 (G701VI-XB72K) with a Core i7-6820HK CPU, 32GB of RAM, and a 512GB SSD. Slightly cheaper configurations should be available in time as Asus plans to offer a version with a Core i7-6700HQ processor. Likewise, more expensive versions are likely to come out as well. There's already one available, the G701VI-XB78K for $3,999 with a Core i7-6820HK CPU, 64GB of RAM, and 1TB (2x512GB) of SSD storage in RAID 0.